Shadow winner for The Sunday Times / Peters Fraser + Dunlop Young Writer Of The Year Award, in association with The University of Warwick announced! “A book either knocks you down or raises you up.” Mihail Sebastian, For Two Thousand Years. I think this book is raising me up. No other popular writer has so triumphantly defied classification … she satisfied all the questionable criteria of popular fiction, and yet satisfied too the exacting requirements of “real literature”, something very few novelists ever do. Surely this is the ultimate goal for a novelist, to bridge the gap between popular and ‘real’. Daphne is perpetually popular, and, as far as I know, genuinely respected as a writer. She bloody should be anyway. As any of you who have read the seminal Rebecca will attest, she can both move and horrify you all at once, and absolutely stun you with the beauty that she manages to create with only words as her tools. This is a tale of such emotional brutality and moral dislocation that it feels as if it’s been wrought by a master, someone who has seen, known, and grappled with the world. Chilling then, to discover that Daphne du Maurier was just twenty-six years old when she wrote it. Chilling indeed. Daphne had knowledge of this behaviour, this emptiness. When you read Julius with this in mind, and observe the ways in which he treats those around him, even those closest to him who love him, it is tragic to think that Daphne knew just how to construct those moments of cruelty and ‘moral dislocation’. They are truly masterful. As a novel Julius is a bit of a slow starter. I was much more gripped by it once our anti-hero had arrived in England and begun his attempts to ‘put a chain around’ the country with his empire. Here we see not only the depths of his single-mindedness, and his lack of concern for others, but also the secret warmth in his heart – the longing for a home, a country, the nostalgia for his father and grandfather. The reader alone sees the humanity in him, and his struggle with it. I’m sure it would be possible to place Julius on some sort of spectrum of psychosis, such is his willingness to forego care and attention, and instead choose only his selfish determination. He is troubling and fascinating, and a truly impressive creation. 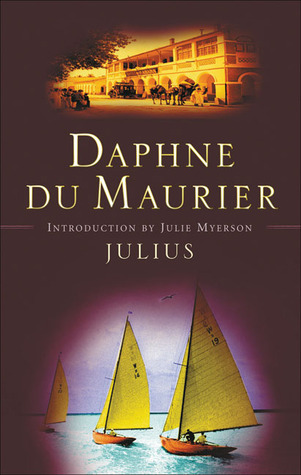 While Julius is not the greatest of Daphne du Maurier’s novels, its central character is one of her greatest, and the novel is a necessary step on the road to the genius that created Rebecca, and more besides. I wouldn’t necessarily recommend it as the first of her novels to read, but once you appreciate her style and understand her intentions, it is well worth the time and effort. Originally published by Heinemann in 1933. I read the Virago Modern Classics edition from 2004. It is a fantastic book, but not her best, I have to admit. But definitely do read her novels if you like her short stories – I need to read more of both! I read this a few years ago and I also remember being impressed that du Maurier had written a novel like this at such a young age. It’s not one of my favourites but I did think it was a very powerful story and Julius a fascinating, though unpleasant, character. If you haven’t read The Scapegoat or The House on the Strand yet, I recommend both of those! I’ve just read and commented on your review! Such a great post. I agree with you completely. I’m glad I read it, and now even more eager to read more of Daphne’s novels.